Yesterday was another not so great day, at least that is what the teachers said it was. After a 15 minute TALKING DOWN TO by the teacher on how he knows what is appropriate behavior and the way he was acting is not appropriate… I took my son home. I honestly did not even know where to begin. To make matters worse it seemed Gracie was having her own little Drama because so and so said she did not want to be her friend today. I was ready to lock myself in the bathroom and not come back out, but knew that was not an option. So instead I told the kids to throw their backpacks on the ground and we took a snack and sat outside, picnic style. For awhile we just sat there, enjoying the Spring sunshine and fresh air. It was good for us all. Eventually I got to the point at hand. I started with Grace because well even though I knew it was going to be a soap opera in the making, it had to be easier than Jay. She talked, I listened, Jay read his comic book. With a few nods of my head and a couple of uh huhs… she was feeling better and went inside to start her homework. There we sat… just Jay and I. My sweet brilliant boy looked at me and said, “So I suppose you want to talk about today, huh?” I shook my head yes, stalling for time and perhaps the right words. What are you supposed to say that? I was lost for words. My heart was so very heavy! I ached for him. I had to fight back the tears. I think a few escaped anyway, hell just writing this now they are escaping. I am so very angry people. I am angry that my boy feels this way. I am angry that I just can’t kiss the boo boo and make it all better. And I am angry at the school and the teachers whom I am not sure really get my boy. How can you expect him to act appropriate if he does not know what appropriate is? They say he should know better, but guess what folks, he has Aspergers. It is not an excuse, it is a reality. Things don’t click for him they way they do for you or me. For example, it was cold in the morning so I told Jay to wear his jacket. At noon it warmed up to 80 something degrees. Jay still had his jacket on. The teachers told him to take it off but he argued saying I told him to wear it! He was right I did. I forgot that I needed to remind him that when it warmed up he should take the jacket off. Where something like this may just come naturally to some,”I feel hot so I’ll take the jacket off”, well Jay doesn’t think like that! Yelling at him to take the jacket off will not help. So Jay gets upset, confused, and his head starts spinning trying to figure out how he is supposed to act. The Wheel of Emotion lands on Angry and he shouts out words he knows he is not supposed to say. Or it lands on frustration and he slams his fist on the desk causing the papers to fly across the room. Or it lands on Bankrupt and my boy becomes unglued… melting down to the floor in a heap of tears. I know I need to fill my son’s wheel with good adjectives and coping mechanisms and get rid of the nasty ones like frustration and anger. I tell him this and he looks at me confused and says, “Mom that would be cheating, rigging the wheel.” Just another example of how his mind works. Every day my boy lets me into his world. A get a glimpse of just how special his mind is. It fascinates me and also worries me. How do I reach out to him, help him but not change who he is? I am not sure if there are answers to these questions. The only thing I am sure about is that some how, some way I will make the teachers see my boy, accept my boy… HELP MY BOY! And if I have to rig the wheel… so be it! Problem with the jacket was he got overheated and ended up in the nurses office! SIGH! It’s really ironic how brilliant his mind is, yet the simplest things are so hard! I love the way he expresses his feelings to you. He is able to paint such a clear picture of what’s going on inside of his head. I wish we could fix it and make their world perfect. We can help give them the tools, but their will always be something or someone in this world that will set them off, at school and eventually at work. Life is hard for the average person. It’s twice as hard for our guys. Can I, like, cry? Please give Jay a big hug from me (if he’s cool w/ hugs) and tell him a mom w/ aspergers gets him. <3 I will come to this again later. I'm all emotional now. He's not bankrupt. Tell him he's not bankrupt. He's just getting too many messages at once from all around. I'll help him organize it. Jay, you aren’t bankrupt. Ok? You’re not. You just get confused with everyone around you giving you too many ideas all at once. It’s overwhelming and frustrating. You need to organize these instructions so you know which one to follow. I have Aspergers syndrome, too, and I know how frustrating and angering it can be when you’re given conflicting information. We’re concrete thinkers. What we need to do is figure out where there’s a grey area and figure out where we can make a different decision. When we don’t have that figured out yet, we get frustrated and angry and have a meltdown. I will figure this out for you and I will write about it for you because it will also help other kids like you & me. My son also has Aspergers and he gets frustrated, too. It’s ok. We’ll figure it out. Mom wants to help you figure it out, too. Let her help. And it’s ok if she rigs the wheel. I’ll let you guys know when I have it figured out for you, ok, Jay? Let mom rig the wheel for now. Sometimes rigging the wheel is necessary. I replied on the blog, too. Great post…I can so identify with this and my son!! This may sound odd, but I love reading the blogs written by mothers of children on the spectrum. It gives me a really good idea what my parents went through and reminds me that they lacked the same understanding about me that I did about them. Sometimes our differences can also be similarities. There is so much I wish I could say. I wish I could give you the answers. I wish I knew how I survived childhood and became a high-functioning adult. The only thing that’s changed over the years is I have more experiences to add to my data bank. The more experiences I have, the better I function. I feel like I am always trying to explain what it’s like to be an Aspie. I feel like I harp on it. The thing I always find most frustrating is when I try to explain that misunderstanding is all-encompassing. It’s not just social interactions. I think we know we are different, but we have no idea how. To us, what’s different is normal and what’s normal is actually different. Not only do we not understand why something is bothering us and not someone else, we don’t know that is the thing that is causing the emotion which we aren’t even sure is frustration. Furthermore, emotional reactions are so strong, we are incapable of anything but feeling that emotion in that moment. That’s why the Wheel of Fortune analogy is so awesome. Life always feels like that. We have no control over anything. No matter how hard we try, it never works out and we never truly understand why. We can learn the techniques but that out of control feeling never goes away since those techniques do not always work and we will never understand why. One day my husband made a comment about my black and white thinking. He said it seemed worse than usual. I was completely confused. I always think in black and white what is different about it today is I am unable to identify that’s what I’m doing so I can adapt. Does that make sense? I can’t stop my brain from thinking this way, so I cope by learning how to recognize it and a rule for . Once I can identify what’s going on inside me, things get a little easier. I feel a little more in control. Last week, I started flapping when I was being interviewed on the phone by a county service worker. He kept interrupting me. This is frustrating, because the rule is you don’t interrupt. I was taught you could say one sentence and had to stop and wait for your turn. I always employ these two rules and they seem to work okay most of the time. It’s hard for people to imagine that to us that means there will never be a situation where it will be okay to interrupt someone or a situation where you can say two sentences. I was frustrated not only because the worker was breaking the interruption rule. I don’t understand why it was okay for him to interrupt and I can’t. If I can’t do something, it is even more frustrating when someone else gets away with it. I don’t know if that explanation will be helpful or not. It seems like this is one of those things that is extremely difficult to explain. At least for me, I just want to make the people around me happy. No matter what I do, it never works. I spin the wheel and it lands on something random. Living with autism is a growing process. It’s something we will continue to adjust to and change throughout our lives. The one thing that always made me feel better was when my new therapist told me the following: It may be harder for you to learn to cope, but the reason it’s difficult is also the reason you will succeed. What she meant was that it takes a long time to learn about appropriate behavior. Therapists have to go through every possible situation and outcome since we can’t put things in context. However, that is also why we adapt so well. When we are taught a coping technique, we will do it every single time for the rest of our lives. An example of this is the conversation rules I gave above. Another example is how I apply those rules to everything. One of my writing professors once made a remark about how it was amazing that I never info dump in my fiction. It’s a rule. You can’t give that much information and I carried that into my creative writing. Does that make sense? I better post this before I delete it because it’s way to much information. One or two sentences. lol. 🙂 Have a sense of humor. That’s what gets me through the day. This was incredible and so insightful! Thank you so very much for sharing this! I plan on showing my son this tomorrow so he knows he is not alone and that he (no WE) will get through this! I hope you will continue to come back and share your experience with us! I stopped reading after the word “appropriate” which is not a useful word for anyone trying to cope socially. Michelle Garcia Winner uses the words “expected” and “unexpected” when working with her clients. This removes the judgment (who is deciding what fits and what doesn’t?…this reaction FITS the in the world of the Aspie who is just trying to manage the sensory confusion) With an understanding of neurodiversity, comes an obligation to create and use more effective language and to choose words which HELP our communication not perpetuate the frustration. I feel for you Jay. My son and husband are both on the spectrum. Life as a game show is the perfect analogy. With help and advocacy (go Mama go!) 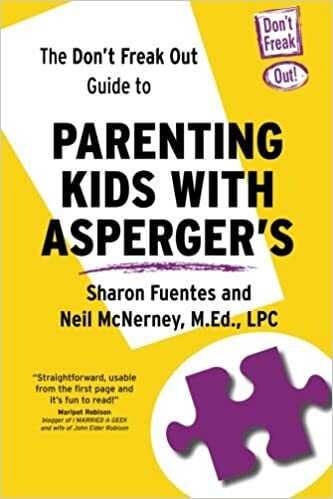 we can begin to create a new “game” where everyone can “play” and grow and learn from each other and Aspies can tell NTs how to speak Aspergian. Thanks for your article. Frankly, I feel pretty irritated that we aspies are expected to change, adapt, and flex to the non-aspie world. Why must WE be the ones to change? Why can’t non-aspies do the same thing? You know? Work together, cooperate. Show me your way and learn from mine. We spend our whole lives bending to other people, doing what they expect, and when we don’t, they act like we are the problem. I love seeing parents advocate for their kids and want to help and learn from their kids and other aspies. That’s the only way neurodiversity and acceptance will happen.